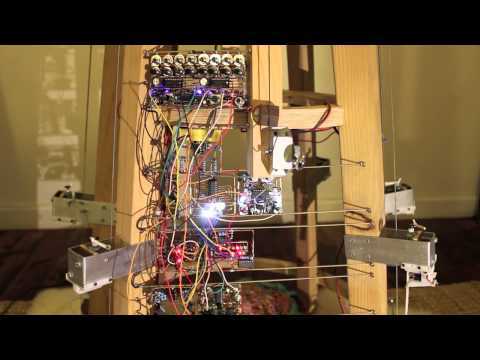 Modular Synth driven Semi-Acoustic stringed instrument. The Lunetta Guitar uses no computers nor microcontrollers, all circuitry is CMOS discrete analog designed freeform, space wiring style... no toxic circuitboards. Physically patchable with cables, no coding. This self generating patch is acoustically recorded with Binaural microphones to pickup the spacio-harmonic sounds that swirl around this instrument. If you wear headphones it gives you the impression your head is inside the Guitar. The synth-guitar just continues to spit out quite complex, evolving (algo)rhythms like this all day long, all by itself! “Each module is made in free-form style (Point to point, Space Wiring) where no PCB or prototyping boards are used. Each Module will be based on a 50mm x 50mm format using SIP connectors and Breadboard jumper leads to patch the modules together. In this video the modules are temporarily affixed to a wooden frame but the Lunetta Guitar will have a grounded wire frame between each guitar neck where modules will be secured. New module for the Lunetta Guitar. An 8Band auto-switching motor gate signal interruptor Duo 4bit Slewed CV source thrown in just for good measure. I wanted the guitar to be able to switch rhythms on its own and designed this module as one that would be used in both performances and installations. A bank of 4 solar (PV) panels, each corresponding to a motorized plectrum, are covered/uncovered with sand to alter the rhythm and timing of the actuation. Contact mic on drum skin into Amp input for feedback loop. 128strings string into the Music Hall. When wind come through from the window on the top, strings start ringing and resonate in the room. An infinite variety of sequences is possible with this set up, it gets really interesting when the tempo and theme parameters are altered. Complex harmonics are heard through the individual pickups, rhythmic drones. This video is shot using the low end camera mic. Sorry. A weird querk is when the Muse is shut down... for some reason the motors spindown and drain a voltage. Heat test. String tension too tight. Solar Modules in trackable parabolic mirrors collecting reflected/focused sunlight, the solar energy is stored in small capacitors regulated to drain the power to small motors when a predetermined voltage has been reached, in this case 3.2v. The motor units are located in adjustable housings above the single string and strum them when this power is released. Pick is spring loaded to return after each action. Each string is tunable by means of piano tuning pegs, furthermore each string has it's own magnetic pickup so various guitar effects pedals can be used in isolation from each other. Resonating bodies made from metal drums allow the units to be used acoustically. This was made in Perth over January/February 2011 for I.n0jaQ as an installation for the SOMETHING SMALL Festival 2011 held at Kurb Gallery. "Don't Green Wash Me You F#cker. Ten Sou"